High cheekbones and a strong jaw line have had a long history of allure. Along with the eyes, the cheekbones and jaw line form the most photogenic aspects of the face. Chin and cheek implants are a great way to enhance a facial profile by improving the overall proportion and balance of the face. With chin implants (mentoplasty), the symmetry and harmony of the face can be shaped and contoured. Cheek implants (malarplasty), also known as malar (high cheek) or submalar (low cheek) augmentation, can add fullness and definition to the face. 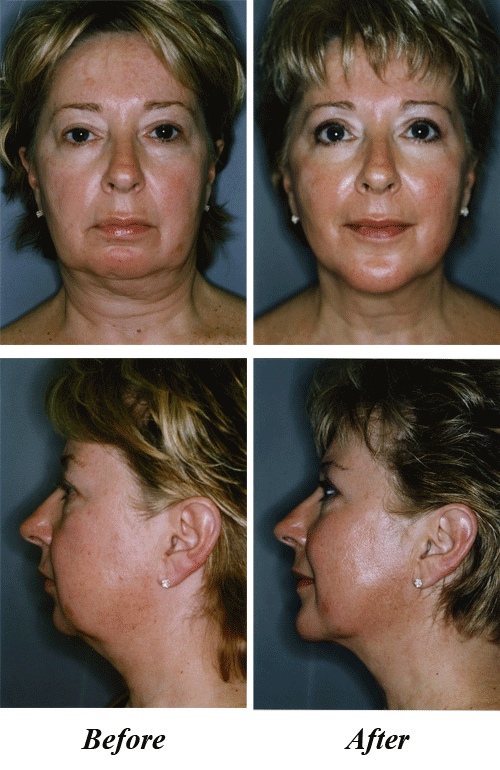 Utilizing permanent chin and cheek implants can provide a rejuvenated, youthful facial profile. With chin surgery, an implant is inserted in front of the jawbone in order to augment the chin or jaw. A small incision is made inside the mouth to allow the implant to be positioned in a pocket just under the skin. An alternate location for this incision is below the chin (on the outside). Chin surgery is commonly performed along with rhinoplasty (nose surgery). With cheek augmentation, incisions are made either inside the mouth, through the lower cheek, or directly below the bottom eyelid on the high cheek. Cheek surgery is often performed in conjunction with a facelift procedure. Both chin and cheek implant procedures normally last from 30 minutes to 1 hour. These procedures can be performed under local anesthesia, with sedation, or under general anesthesia as same day surgeries. Immediately after surgery, the face will be fitted with bandages, taped, or otherwise secured in order to speed the recovery process and to reduce swelling. Generally, post-operative instructions call for plenty of rest and limited movement in order to speed up the healing process and recovery time, and to prevent movement and/or displacement of the prosthesis. Keeping the head elevated during the initial recovery phase is also important. Patients sometimes report minor pain associated with surgery. Any pain can be treated effectively with oral medication. Patients may experience some swelling and bruising of the face, which can be eased by using cold compresses. A liquid diet may be required for a few days, as chewing may be difficult. While complications are rare, patients can minimize potential problems by carefully following the post-operative directions given after surgery. The substance used for chin and cheek implants is made of durable, solid material that will last for years. Recently, we have had success with injections of long-lasting fillers such as Radisse and Scalptra. The advantage of injecting these products are that no surgical procedures are required and after 18 months or longer, these fillers will be absorbed. In any case, Dr. Mahjouri or one of his staff will call you soon after the procedure or filler injection(s) to assess your condition and address any concerns or questions. Any blood thinners or aspirin-like medications should be avoided 5-7 days before surgery or receiving an injection. Contact our office to receive a free mammoplasty consultation. Mahjouri Cosmetic Surgery & Skincare Clinic provides breast augmentations to patients from Fridley, Minneapolis, Anoka, and the surrounding communities. For more information, or to schedule a consultation, call our office today!